Well, It took me almost the entire week, but I read through every one of the link ups of last weeks first Bits of Splendor Monday. I loved seeing how you each picked out the beautiful distinct moments of your every day life. Megan from Beautiful Bits of Grace has me searching for a high chair just like this, just so I can paint it pink. I'm just not sure there is anything sweeter. and meet my kids needs in the moment. To extend a little extra grace. And I also need to allow God to do the same for me." Something God has really been showing me lately is that every person has a desire to be heard. We each have a voice, an opinion, a story to tell. If you think about it, we hold a lot of power in our voices. In our words. We have the ability to encourage, inspire, motivate and even change things with just a few of them. that make life so distinctly beautiful, but also the people. Your children, your husband, your parents, a friend or neighbor....but strangers too. The person at the drive thru window, your mailman, or librarian. Those people that very often go unnoticed. Seek them out. Say hello. Ask how their day is going. You will be surprised at how a persons face will change when you show even just a bit of interest in their day. The same goes for here. A simple, thoughtful, genuine comment, could mean so much to a person and end up cultivating a friendship that might not have ever been. Stretch out a bit. Expand your walls. Meet some new people. Whatever you do this week to seek out the splendor of the every day, seek out the people in it too. Also be sure to check back this week for a really special GIVEAWAY that I am really excited about!! I can't wait to see what you have to share. Happy Monday Friends! 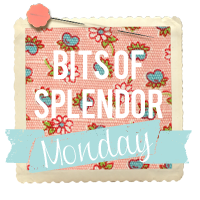 Please remember to link up to your specific post and also include the Bits of Splendor Monday button in your post. Thanks for your sweet words, Laura. And I really appreciate your thoughts on taking notice of others. That's been on my heart so much lately - showing people a genuine interest. Thanks for the encouragement! I love this... "meeting" some other through their happy moments. Thank you and Happy Monday. laura i am so glad your doing this. i feel like in the hustle and bustle of my life i don't always log special moments especially with my boys they are growing so fast. this is seriously helping me be more intentional. thank you. i hope you find a high chair like that it's great. Thanks for the shout out on my highchair redo! I am flattered you like it :) It is so fun linking up with such a sweet and thoughtful blogger. You always encourage and inspire me. You are so inspiring... I just stumbled on your blog a d could NOT stop reading. I have 2 children, a 3 year old and 16 month old. Between my 2 littles... I lost a little boy at 21 weeks. Your story is inspiring to me. I have never crossed anyone who went the the same thing as me. Your words were my feelings exactly... Thank you. Just saw that high chair on craigslist. Well your perception about the things regarding parental aspect really inspires me a lot....I have kids and really feel that they mean a world to me...! !